Seattle Mixtape, Washington DC Space Heater, San Francisco Mischief, and New Jersey Jughandle are an unusual group with lots of potential. The tournament’s most surprising attendee and an unlikely champion of one of the division’s most notoriously difficult Regionals headline this p– who are we kidding? You’re here for Mixtape versus Space Heater. We are, too. It’s the most anticipated pool play game of Nationals. But it’s not the only action in Pool C, where the bottom seeds are both coming off of successful regionals runs that will boost their confidence coming into Nationals. The opening acts might not upstage the headliner, but there’s plenty of reason to catch all the sets. #2 Seattle Mixtape, the reigning national champions, come into San Diego having played fewer regular season games than any other Nationals contending team. 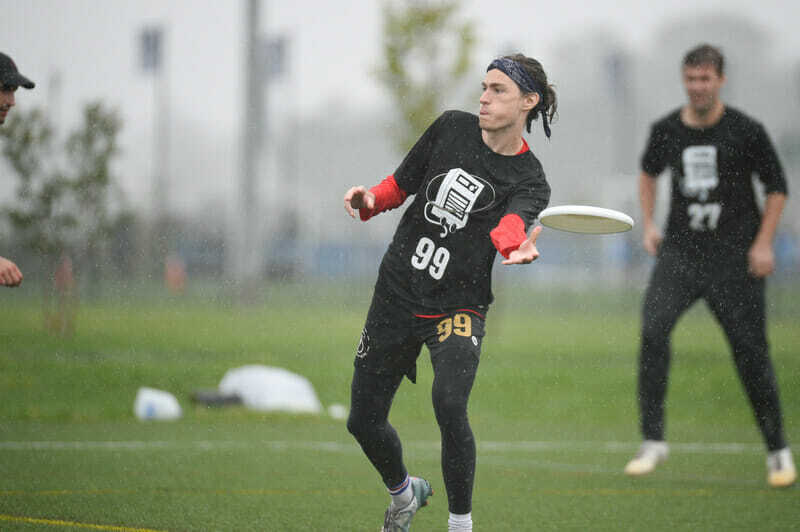 After a disappointing quarterfinals exit at Club Worlds, Mixtape had a rough U.S. Open, going winless on day one before winning out the rest of the weekend. At the Pro Championships, though, they turned it around, finishing runners-up, with their only losses on the weekend coming against Drag’n Thrust in the final on double game point and AMP in pool play. A strong, undefeated run at Northwest Regionals, capped off with a 13-11 win over BFG in the final, set Mixtape up well to go deep into the bracket in San Diego and retain their title. Mixtape returns nearly all of their title-winning squad, with Mark Burton, Brad Houser, and Khalif El-Salaam continuing to set the pace for this deep team. Lexi Garrity and Ellen Goldberg present difficult downfield matchups while Bert Abbott and Evan Klein lock it down on defense. They will undoubtedly put some names in the mix for All-Club come season’s end. While Mixtape did not see any of their poolmates during the season, there are some interesting storylines to keep an eye on Thursday. When Space Heater formed in the preseason, there were murmurs that they would challenge for Mixtape’s title, with the conversation even spilling over to Twitter, and now the online squabble can be settled on the field. San Francisco Mischief also returns to Mixtape’s pool after underperforming last year. Mixtape looks to be in good shape for at least a quarters finish, but will be setting their sights on a title remix. #6 Washington DC Space Heater is a newly formed team this year but is stacked with talent from around the country and from all divisions. There were early discussions about Space Heater potentially challenging for the championship. At the AMP Invite, their first tournament as a team, they lived up to that billing, notching wins over fellow Nationals qualifiers Jughandle and AMP. Space Heater stumbled at the Chesapeake Open with losses to Toronto UNION, Boston Snake Country, and West Chester Loco, but finished strong, losing only to AMP on their way to claiming the second Mid-Atlantic bid. Of their three poolmates, Space Heater has only faced local foes Jughandle, but did win both of those matchups in the early season AMP Invite and then at Mid-Atlantic Regionals. Space Heater’s matchup with Mixtape offers to answer the early season speculations, while their game against Mischief could determine their bracket path. Space Heater can potentially win the pool but could also draw a poor prequarters matchup and be out of contention before Friday afternoon. Space Heater recruited well from the women’s division, with former Scandal players Jenny Fey and Sandy Jorgensen combining their talents with San Francisco Fury’s Claire Desmond and Madison Heist’s Georgia Bosscher. On the men’s side, Patrick Shriwise joins up with Joe Freund and Alan Kolick to make up a very dangerous overall roster. #9 San Francisco Mischief enter Nationals having won the Southwest Region but not without some bumps along the way. They played well throughout the season, losing no more than two games at a tournament, and gathering wins against New York Xist, Durham Toro, and Columbus Cocktails along with their San Francisco neighbors, Polar Bears and Blackbird. Mischief’s season was in flux, however, at Southwest Regionals, where, as the no. 2 seed, they were upset twice in pool play before winning the win-or-go-home prequarters matchup against Reno Cutthroat and winning out from there over Blackbird and Polar Bears. Mischief has the talent and experience to compete against the best teams in the division, but if they play like they did on day one at Regionals, they could be out on day one in San Diego. Mischief has not seen any of their pool play competitors this year, but return to Mixtape’s pool after being placed together last year. Their game against Space Heater could determine prequarters seeding, with potential rematches against Polar Bears or shame. looming in the prequarters bracket. If playing down on Thursday, their match against Jughandle could also determine who is eliminated on day one. Mischief returns a strong crew from their previous Nationals appearances, with a healthy Han Chen leading for the women while Cody Kirkland and Kevin Smith distribute to the stable of cutters. Mischief also added Julia Butterfield, formerly of Chicago Nemesis, who can check the top women in the division. #22 New Jersey Jughandle make their Nationals debut in San Diego, taking their place in the tournament by finishing third in the Mid-Atlantic and taking West Chester Loco’s strength bid. Jughandle is the most unexpected attendee at the Club Championships, but they have cut their teeth on the circuit this year. Jughandle had a busy season and took early losses to AMP and Space Heater before starting to round into form at the Philly Invite, only falling to Loco. After a strong Chesapeake Open where they picked up a win over Xist and lost a close match to Snake Country, Jughandle came into Sectionals as the no. 2 seed, but lost twice to leave them underseeded at Regionals. However, they only lost twice at Regionals, again to AMP and Space Heater, and won a tightly contested game-to-go over Loco to win the final Mid-Atlantic bid. Jughandle brings a potent group to San Diego from around the Mid-Atlantic, with Jess Wolf and Charlie Cannon captaining and leading the D-line. Harrison Treegoob and Natalie De Jesus headline a high powered O-line that will challenge the pool’s deep defenses. The team has benefited from strong coaching from Judy Jarvis, creating buy-in and enhancing the efficacy of training. Their first trip to Nationals might feel pretty familiar, since they’ll face off with Space Heater in an in-region matchup in round one. They gave the DC heavy hitters a run for their money in their season opener, and have solid results against Xist and Snake Country to look back to. Their record against the field is an unimpressive 1-7, making them a healthy underdog, but one with some bite. Comments on "Club Championships 2018: Pool C Preview (Mixed)"